Over the last decade, Mouse On Mars have become one of the leading names in European electronic music. Their experimental approach brings together analogue and digital, lo-fi and hi-fi, and real instruments and samples to create an organic-sounding whole. 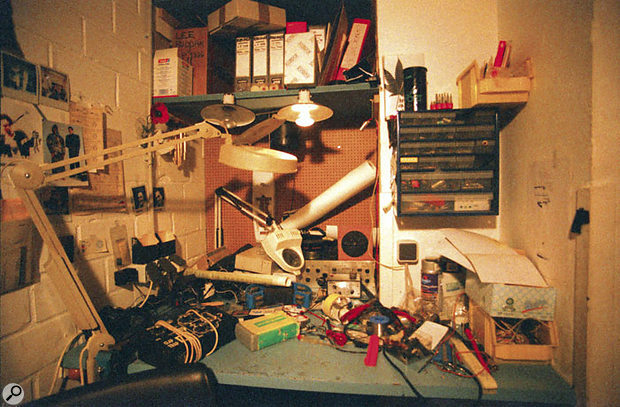 It would be hard for a band called Mouse On Mars to take themselves too seriously, and a sense of humour is certainly apparent in album titles like Vulvaland, Ideology, Niun Niggung and track titles like 'Stereomission', 'Omnibuzz', 'Yippie', 'Circloid Bricklett Sprüngli' and 'Paradical'. What one wouldn't suspect is that Mouse On Mars are the European leaders of a genre that's often all too serious: the electronic music avant garde. Hailing from Germany, MOM consist of Andi Toma and Jan St Werner, and have been making boundary-, speaker- and mind-bending albums since 1994. Given the band's tendency to hide behind enigmatic quirky humour, it's a pleasant surprise to find Jan St Werner straightforward and to the point. For instance, he explains that the Mouse On Mars name was chosen because "Andi and I liked it for the sound that it has and we thought it was an unobvious name for an electronic band. It also sounded as little academic as possible, and people around us said things like 'Yes, that's nice, I can relate to it.' But we weren't aware that we would become... famous. And now I have to say that we don't like it very much. Some evil force has given us that stupid title... it still sounds nice, but when it comes to what the words mean, I get bored." 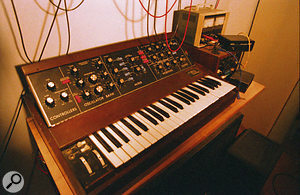 Jan St Werner professes to find synths boring, but he still finds room for the classic Minimoog in his studio.Photo: Rosa BarbaOther artistic choices Toma and Werner made in their early days in 1992 were more fortuitous, and laid the blueprints for MOM's musical direction and success. "At the time Andi and I just wanted to work with what we had equipment-wise," St Werner recalls, "and we didn't want to be too... academic about it. I don't mean this as some kind of anti-concept. Academic for us doesn't only mean complex music done by people who are formally trained, but also being very aware of your surroundings and the genres and clichés that you are influenced by. We didn't want that. We wanted to stay away from all clichés and references to influences. "In our early days we would occasionally use a sample from someone else's record, like on Vulvaland we used a few samples from other people's records, something we don't do any more. But even at the time these samples were never used to pay homage or as a reference to our record collection. We always detested that. It's an academic way of looking that comes across as clever, but limits you very much. Instead we used these samples like all our sounds, as pure sound — they became very personal examinations of the structure of sound. I think this is still our focus: not to see what genres we are connected with or which aesthetics we play around with. But to create a very personal music trying to see how far we can get with all the elements we work with, all the equipment in the studio and the psychoacoustic things and the effects and synthesizers, and tape echoes." The band's studio, St Martin Tonstudio, is based in Düsseldorf, where the equipment is impressive enough for it also to function as a commercial studio. 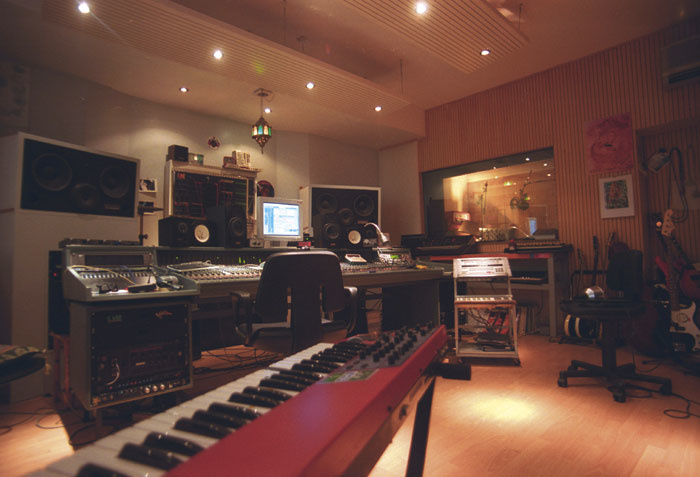 More traditional studio equipment includes a 40-channel in-line VCA-automated Soundcraft DC2020 desk, Westlake Audio BBSM 12+ subwoofer and Yamaha NS10 monitors, a wide range of top-quality microphones and outboard gear, plus a Studer A800 Mk3 analogue 24-track and an Akai ADAM 12-track multitrack. The hard-disk side of the studio comes in the form of a G3 Powerbook with Digigram soundcard and various sample editing and treatment software, a G4 with Logic Audio and loads of plug-ins, plus a MOTU audio interface. The selection of electronic sound sources at St Martin Tonstudio is relatively modest, and includes an Akai S1000, S1000 keyboard, S1100, Emu E6400 with 1GB hard drive, Emax 2, Sequential Circuits Pro One ("still an important bass sound provider for us") and Prophet 5, Moog Polymoog and Minimoog, Clavia Nord Lead, Roland JD800, and Korg ES1. Toma and St Werner's main sequencer for early recordings was an Atari with Creator software. "A lot of what we do is sampled," explains St Werner. "And then we may double a sample part with a live instrument. That mixture is still interesting for us. We always have this thing of making sure you can't really hear whether it's quantised or not." Although they do use synths such as their Oberheim Matrix 1000 and Matrix 6, Mouse On Mars make greater use of samplers such as the Akai S1100.Photo: Rosa BarbaToma and St Werner's predilection for mixing electronics and acoustic instruments and feel comes in part from their backgrounds: Toma is a guitarist and St Werner a drummer. "But Andi likes to play the drums as well, and I like to use the bass," St Werner explains. "One of us may start a track by playing some drums on a drum kit, and we'll sample and loop this in the Emagic EXS24 or Reason. These rhythms are quite rough, and in the sampler they are further cut and spliced and reconstructed, and become a mixture of the original oddity of what you played and the precision of the sequencer. And then we may add another live drum track to that, or program a drum track, or process with whatever software. Dodo [Nkishi], our drummer, may just add a live hi-hat, or we might put his hi-hat in the sampler in shuffle mode. We trust the rhythm, not just to intellectually try to capture it and see what tricks can be played with it in your brain, but just get into it and open up to it. It may speed up or slow down or go into triplets." Something that's particular striking about Mouse On Mars is how spontaneous and unpremeditated a lot of their music sounds, sometimes to the point of seeming chaotic. While there are also always clear structures present, it's as though Toma and St Werner work part of the time in stream-of-consciousness mode, throwing heaps of instant ideas at a white canvas, or in their case, a hard drive. "We like to examine the structure of every single sound," says St Werner. "We spend a lot of time on this. And then, once you put these sounds into the song, you see another structure. You see the narrative, which is more arranged, more linear, more like a song with introduction and verses and chorus. All these parts, all these bits of narration, have many levels, and every sound itself has different frequency and dynamic characteristics and things. We like to see the core of a song, and in there are lots of different sounds. They're like a composition, and they have to work with each other and one has to lead to the next one. The story told in our music makes you willing to accept a lot of strange things. "How we produce sounds is very intuitive, and the result of a long process. We may work a couple of weeks on a track, and put all sorts of things in, and the narration is changing, the structure is changing. It's an awareness of feeling... where the space in the track is, and how every time you add something, the space can become even larger. We follow this and watch it and the more we get into it, the more we see space here and another possibility there that can hint at another direction, and in certain places it can become very dense and in other places it can open up. The MOM processing arsenal includes the odd home-made speciality.Photo: Rosa Barba"We want to create space, we want to shape space — we don't want to stuff the music. But often the more you throw into the track, the more the story, the personality of the track, becomes clear. Sometimes you have to be very strict, and decide that certain things should not happen. That's a constant game and it changes by how you feel on any particular day. But we feel there's so much space in music that we can do this. There's no other art form that has the space music has. Music for me is pure structure. "A sound triggers emotions and references in your mind and it may be something that you don't fully understand, and there's a sound right next to it that you hear on another level. All these relationships become like a well-cooked dish. You can taste the ingredients separately, but all together they make something different. When you have all those different elements, you can't control it any more. It's so complex that it's playing with you as much as you play with the music. I like that, when music really invites you to see what you can do with it. 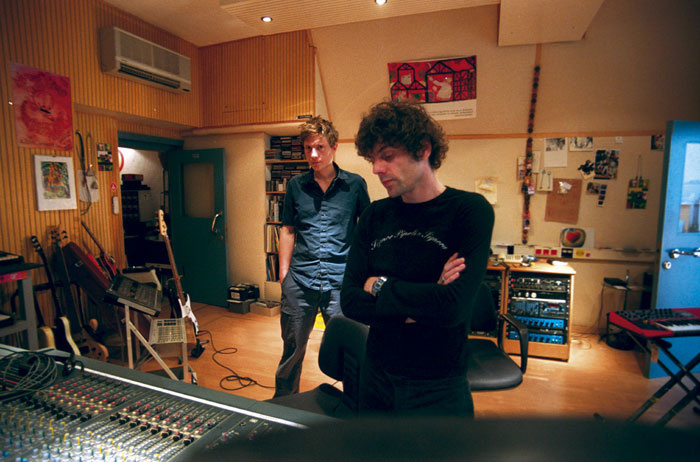 And then you get to that feeling in the studio of producing something that feels very unique and very special to you, and that probably no-one else has made before." Perhaps the most immediately striking aspect of MOM's "very personal examinations of the structure of sound" is that they're not afraid of deliberate ugliness. "I'm quite surprised that not too many people are doing this," St Werner commented. "Most electronic artists try to have a clean and polished strange glossy sound. I don't understand what the attraction of that is, because you have this in every bad Disney movie. But as much as we like abrasive and edgy stuff, we also like nice sounds. We spend a lot of time on this balance, and I like it if you can't tell whether the music is produced badly, or is lo-fi or hi-fi. "We like hi-fi and lo-fi sounds! But whether a sound is hi-fi or lo-fi is not really that important, because every sound has its own character and dynamics. Sometimes you have distortions just in a certain frequency range, for instance around 200Hz, and the other frequencies are OK. If you really look at a distorted sound, you hear that distortions are rarely all over the frequency spectrum. Every sound has its lo-fi and hi-fi bits and we try to find ways to combine all these elements." MOM regularly perform live, either just Toma and St Werner, or as a trio with drummer Dodo Nkishi. St Werner explains: "We'll have a table full of immediately touchable electronic stuff, like drum machines, effects, small synths and two Boss samplers, and virtual stuff on the G3. For the electronic duo performances we use drum machines like the Korg ES1, the one in which you can sample your own sounds, and the Jomox Airbase, a very clichéd, analogue revival techno user-friendly box. It's a very pleasant drum machine that we also sometimes use in our studio recordings. "I also have a very small analogue synth that just runs one waveform which you can modulate. It's from the late '70s, and it doesn't have a keyboard. You hit it and there's only one oscillator. We don't have a keyboard when we play as a duo, but when we play as a trio I'll play some synth stuff, perhaps on the Nord Lead. I also have the G3 with Logic Audio running a couple of plug-ins and Reaktor patches, which I play with a keyboard and a MIDI controller. One output from the G3 goes to an amp and a cabinet, very much like playing guitar. Many of the sounds I use are quite guitar-like. The other G3 output goes straight to the desk. We used to take a G4 with us on tour — we even had a special backpack to carry it onto a plane — but the G3 sounds good enough and is very reliable. I have the Pismo, which has two analogue audio outputs. If the Digigram soundcard malfunctions for some reason, I can still use the analogue output on the G3." Mouse On Mars are not afraid to take their examinations of sound to the edge, and beyond. Yet making sure that things sound quirky and spontaneous remains at the heart of their game. Part of their method is to approach electronic instruments in an organic way, for instance by playing almost all their samples manually or doing treatments in real time and recording the results. "Kraftwerk wanted to make their stuff sound cold and mechanical, making their music sound like you would expect from someone who is new to using electronics," St Werner muses. "But that was a distinct choice from the musicians, and not a rule that comes with the instruments. Electronic music is so culturally loaded with clichés — like that it is mechanical and mathematical and not intuitive — that they are difficult to overcome. But it's also a political thing to believe that you can't reconsider things in your own way. What we do is ignore those clichés rather than intentionally break them. "Of course, the time aspect is different with electronic instruments. If you're a good musician, like a drummer or guitarist, you can listen to yourself playing in the moment. But working with electronics is not so immediate, because you record snippets, and restructure and reconsider them, move them backwards and forwards and cut something in or out. It's more like working on architecture, which is very modular and flexible. We don't use the synthesizer in a mechanical way, we always approach it as an immediate tool that can be as flexible as any other instrument." According to St Werner, this flexibility also extends to sound programming and processing. "We put every sound bit that we have into the computer, and edit it, but then we play it with a keyboard. Sometimes we have to force ourselves to repeat a certain sound, and not to have too many sounds and too many variations. It's a constant restructuring of everything we do, but you also don't want strange and unusual sounds to become the focus of your music. You don't want the listener to be amazed by all the work you have done on the sounds. You want this as the second or third layer in the music, that you can explore if you want to. But it's not the first thing we want to draw the listener's attention to. "It's like on my new Lithops album, Scrypt [one of St Werner's solo projects]. It has thousands of cuts and edits, but that's not apparent. The idea is that once you have all the bits and variations and combinations, things come together as a body, as a piece of music. We like music to be immediate and the actual listening experience not to be too technical. But the closer you get to the music, the more details and layers open up." So much goes into a typical Mouse On Mars track, if there is such a thing, that it's illuminating to look in detail at just one. 'Actionist Respoke', the opening track of Ideology, is as zany and outlandish a concoction of off-beat, edgy rhythms, distorted vocals, treated samples, unidentifiable sounds, scratches, and synth and sample hooks as one can imagine. "It's difficult to say where the drums came from, because we always have tons of drum sounds and in the end we don't really know any more where they came from," admits Jan St Werner, "but I think on this track we didn't use any real drums. Some of the percussive sounds come from the voice, and all of them from samples treated in Reaktor and in Logic Audio, with the EXS sampler. "The voice is Dodo's, very processed, basically using a digital ring modulator, probably a Maestro guitar effect, linked with an MXR pitch transposer, and used in real time to treat the voice. We then added processing like time-stretching in the computer to get the effects of grains on the voice. We didn't change the pitch of his voice. The organ-like sounds, the bam-bam-bam-bam, and the tatata-tatata-tatata, are also both derived from Dodo's voice. "Some of the voice things with the very short delay, like this b-b-b-b-b with a very glassy digital sound, come from an Ensoniq effects rack, I can't remember the name. It has a silver shuttle wheel and you could do very fascinating things with the parameters in real time. When it came out about 10 year ago it was one of the first very advanced digital devices that you could do interesting things with, like changing the tempo of the delay and echo or changing the amount of feedback. We also fed some loops through the Ensoniq and resampled them, and this became part of the rhythm. "The scratches that you hear were done with back-and-forth sessions between the E6400 sampler and the G3 with Digigram soundcard. You can do real-time things in the sampler, playing samples back and forth, scrolling through the sample and stuff, and we recorded this in the G3 and edited it with software like Sonic Works and Hyperprism, which is a DSP plug-in I sometimes use in Logic. The bass is a mixture of processed electric bass and also the Prophet 5 — which we use a lot — all maximised, pushed to the limits. Bass always takes up a lot of room, and if you really want a bass accent that's audible and punchy but doesn't take all the headroom you have to compress it a lot. So we tend to limit the bass and then maximise it, so that it becomes really loud. The warmth and the body of the bass come from the Prophet 5. "Everything on this track is processed and has gone through samplers, and is played by sequencers. But we also pressed it all in with our fingers. When we made this track we did a long session where we messed around with the rhythm and bass stuff, and then we threw samples in and out and added effects and edited things in the computer. We spent a lot of time to see what worked and what didn't work. Cutting and pasting things in Logic Audio we also made a longer version for an EP called 'Actionist Extension', and for the album and single we had a shorter version." Mouse On Mars achieve their heady cocktail of lo-fi and the hi-fi, anarchic and organised, with relatively little equipment. One reason may be that deep explorations of a few specific pieces of equipment don't leave space for superficial interactions with large amounts of gear. "Our different samplers and A-D and D-A converters all add something different to the overall sound," explains St Werner. 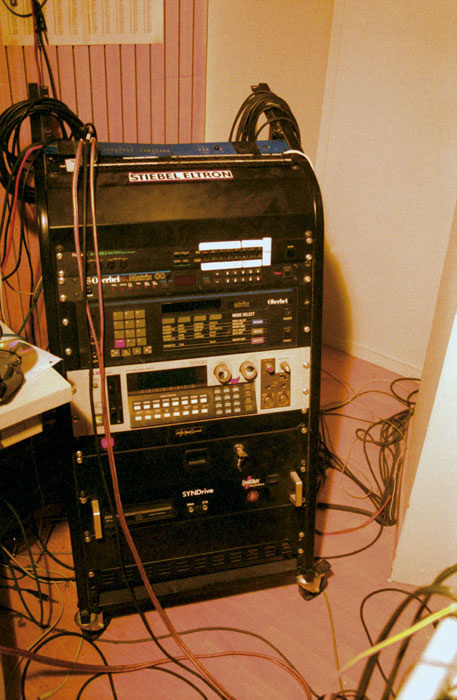 "The Emu is very punchy and quite warm, while the Emax is quite grungy — it doesn't have a very heavy sound, but it has this crunchiness. The S1000 is quite punchy, even though it's not very deep or warm. 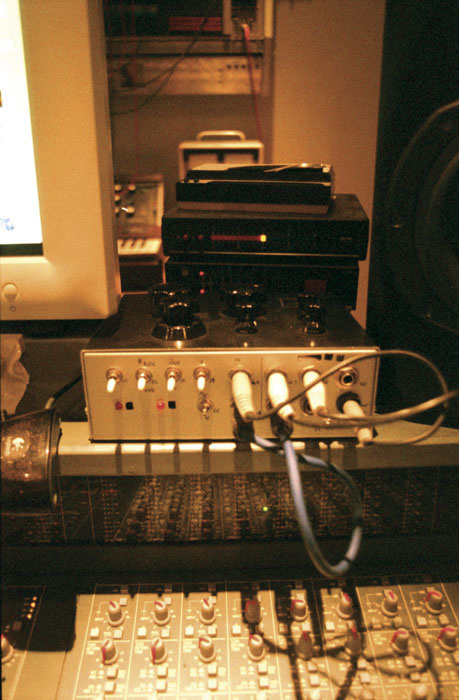 We use the Emagic ESX24 sampler a lot and that also sounds quite punchy. Sounds coming from different sources add different aesthetics and this makes things rich and interesting for us." 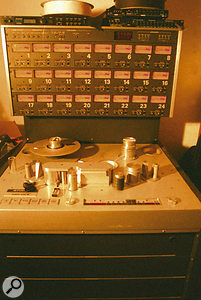 The band's Studer multitrack has been largely superseded by computer-based recording.Photo: Rosa BarbaApparently Toma and St Werner have little use for their analogue 24-track these days, but they use the combination of hardware samplers and sound sources and hard disk editors to create sonic variety. "If all your sounds come from a computer you have a lack of depth," St Werner comments. "Especially the basses coming from a laptop, they're quite empty and unphysical. 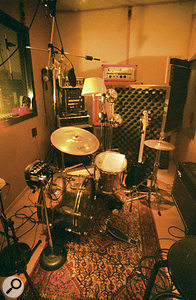 Instead we like to have all these different instruments that make the sound more rich and accessible and interesting. What I may do is sample a sound in the Emu, treat it in there in real time while recording the treatment within my G3 Powerbook, edit it again, and then send it back to the Emu sampler. This back-and-forth process goes quite fast and makes things very interesting to me. 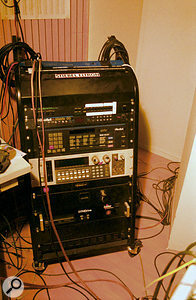 In the past we used to do this with a Panasonic SV3600 or 3700 DAT recorder. I'd manipulate a sample in real time, record this manipulation to the DAT, and then send it back to the sampler. 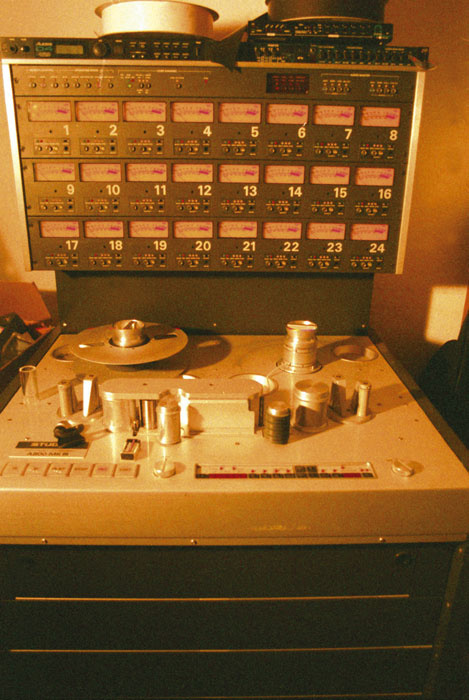 Before that we used analogue tape to see how bad a sample could become, by treating the tape badly, or stretching it or slowing it or making the tape recorder run unsteadily. "We are also too old-fashioned to organise everything on a computer screen, with pop-up menus and so on. But I do use DSP plug-ins in Logic, and may then transfer a sample back to the E6400 or something. The list of plug-ins and software we have is very long. Some basic things in my G3 are Reason, Matrix, BIAS Peak, SonicWorkx, Metasynth and Sound Maker, and I still use Alchemy, which is old software that I really like. The G4 runs Logic Audio as a MIDI sequencer and audio recorder, at 44.1kHz/24-bit, and there are many plug-ins in there. If we record audio directly into Logic Audio we run things through our Soundcraft desk and route it to the MOTU via a patchbay, so it becomes analogue inside the desk and gets 'filtered' there. We had Pro Tools before and used TDM stuff, but CPU processing has become so fast that we don't need special hardware anymore. Just Logic Audio, the G4 and the MOTU as audio interface is enough. And the latency is fine as well. Jan St Werner is a drummer as well as a programmer, and Mouse On Mars also use drummer Dodo Nkishi for live work. 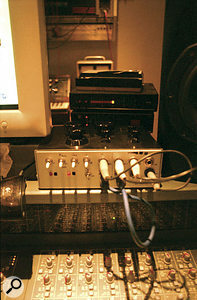 Photo: Rosa Barba"If the capacity of the computer isn't enough, there are the samplers, which are sync'ed through MIDI. The limit is set by the Soundcraft desk, which has 40 channels, and this is normally enough. I have five outputs on the Emu, eight or 10 from the S1000, eight or 10 from the S1100, and maybe a synth with a stereo output. If 40 channels is too little, it's a task for our imagination. We don't use synths very much anyway, because I don't like them that much. I always found synths the most boring aspect of the band. We used them, but we don't like the cleanness of them. They always seem to be very unphysical. I really hate it that when we play live, I'm the keyboard idiot. I just don't like it! "We do like the physicality of the mixing desk, and to have our hands on a fader. As I said, most hard disk stuff I know sounds quite flat and not very rich or complex. Things sound much better through the desk, which is why we run the tracks through the mixing desk for the final mix. There's also a certain excitement that you get when you mix through a desk. You're doing things you wouldn't normally do if you were just bouncing things inside a computer. And when using the desk we like using effects such as the DBX165A compressor/limiter, a Lexicon or the Dynachord DRP20 for reverb and delay, to achieve warm and organic sounds." Mouse On Mars's music is a hybrid of the acoustic and the electric. Toma and St Werner still regularly play their guitars, keyboards, bass and drum kit in their studio, either to record parts live or to sample sounds, and MOM's most recent studio album, Ideology, featured guest musicians on French horn, trumpet, clarinet, cello, violin, and piano. According to St Werner, this 'hybrid' path is very much the way he and MOM are going. This is also in evidence on his new Lithops album, Scrypt, which features a jazz-rock drummer and some woodwind players, as well as "countless edits" and a lot of processing. "The album took about three years to make," St Werner elaborates, "and combines my affinities towards classical, free-jazz and metal music. At the same time it stands somewhere off the beaten track, not really being linked to anything I have done before or am be aware of. I used live sessions, edited and processed them and juxtaposed them with synthetic elements from the computer. Most of it was done on my G3 laptop, including some recordings I made in Austin, Texas. The rest was mixed and arranged in the MOM studio. "As abstract as we have become on one level, as concrete did we want to become on another level. In some ways I think our music is quite traditional as well. And the abstractness that is in our music does not come from a wish to be abstract, but more from the desire to see how far we can go with the means we have and how much we can get into the structure of sound. Sometimes this can turn into a hybrid where you can't really trace the sounds anymore. There may be electronic sounds that are so abstract that you don't have a physical model any more of what produced the sound. But on the other hand, you can examine sounds made by classical instruments just as deeply. A violin or cello sound, as the bow goes over the string, is such a rich and complex sound, it's incredible. I love that, and the music should be able to carry that. There's so much electronic music that is totally abstract, we feel it's much more interesting to see how much history you can carry with you. And when you want to be extreme, just throw off all the old baggage."